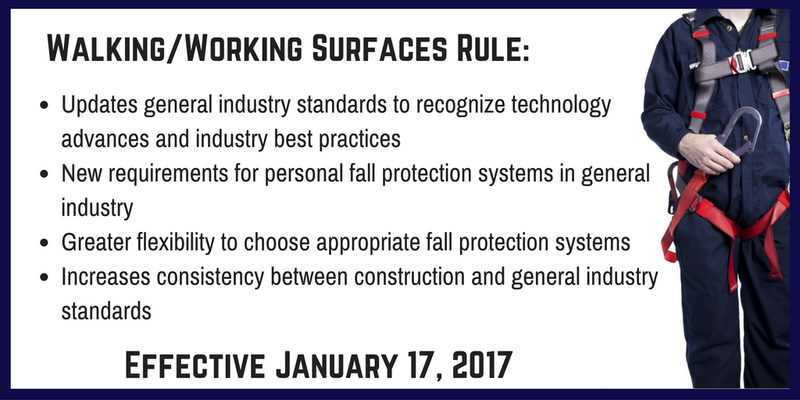 On November 18, 2016, OSHA finally published a final rule updating the walking-working surfaces and fall protection standards for general industry. Percolating since 1990 (55 FR 13360), reopened in 2003 (68 FR 23528) and again in 2010 (75 FR 28862), revisions to the walking-working surfaces and fall protection standards were long overdue. OSHA’s 500+ final rule gives employers new options to combat slip, trip and fall hazards (Subpart D) while adding employer requirements to ensure those new options provide for enhanced safety. It adds a new section under the general industry Personal Protective Equipment standard (Subpart I) that specifies employer requirements for using personal fall protection systems and clarifies obligations for several specific industries, including telecommunications, pulp, paper and paperboard mills, electrical power generation, transmission and distribution, textiles and sawmills. The final rule addresses fall protection options (including personal fall protection systems), codifies guidance on rope descent systems, revises requirements for fixed and portable ladders, prohibits the use of body belts as part of a personal fall arrest system, and establishes training requirements on fall hazards and fall protection equipment. OSHA Administrator Dr. David Michaels stated, “The final rule will increase workplace protection from those hazards, especially fall hazards, which are a leading cause of worker deaths and injuries.” OSHA notes the final rule also increases consistency between general and construction industries, which it believes will help employers and workers that work in both industries. OSHA estimates the rule will affect 112 million workers at nearly 7 million worksites and will prevent 29 fatalities and over 5800 injuries annually. Many employers that have been operating under the cover of OSHA interpretive letters and statements in the preambles of the proposed rules because the standards in place were so outdated and/or ill-suited to particular work environments. For them, the final rule offers an opportunity to confirm that their policies are compliant. However, those employers should scrutinize the final rule to ensure the interpretations they were relying on were incorporated and that no additional actions are required. Some have suggested that Congress may seek to overrule these changes using the Congressional Review Act (“CRA”) (5 U.S.C. §§801-808), but that action is risky because the CRA is such a blunt instrument. The CRA can only be used to repeal a regulatory act in its entirety; it cannot be used to amend the regulation. Moreover, repudiation by Congress of a final rule prohibits the agency from issuing a substantially similar rule in the future. Congress has only used the CRA once—to overrule the ergonomics regulation OSHA adopted at the end of the Clinton Administration. Congress should recognize that the provisions of this final rule are too important to too many employers for it to act reflexively by disapproving the entire rule and prohibiting further action on these issues. A copy of the final rule is found here. More on the final rule, including OSHA’s Fact Sheet, can be found on OSHA’s website here.